The first step in creating a child theme is to create the child theme directory, which will be placed inwp-content/themes. It is recommended (though not required, especially if you’re creating a theme for public use) that the name of your child theme directory is appended with ‘-child’. You will also want to make sure that there are no spaces in your child theme directory name, which may result in errors. 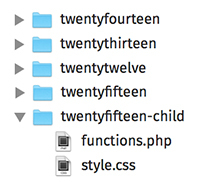 In the screenshot above we have called our child theme ‘twentyfifteen-child’, indicating that the parent theme is the Twenty Fifteen theme. The final step is to enqueue the parent and child theme stylesheets. Note that the previous method was to import the parent theme stylesheet using @import: this is no longer best practice. The correct method of enqueuing the parent theme stylesheet is to add awp_enqueue_scripts action and use wp_enqueue_style() in your child theme’s functions.php. You will therefore need to create a functions.php in your child theme directory. The first line of your child theme’s functions.php will be an opening PHP tag (<?php), after which you can enqueue your parent and child theme stylesheets. The following example function will only work if your Parent Theme uses only one main style.css to hold all of the css. If your theme has more than one .css file (eg. ie.css, style.css, main.css) then you will have to make sure to maintain all of the Parent Theme dependencies. Here’s an example, using require_once, that shows how you can use get_stylesheet_directory when referencing a file stored within your child theme’s directory structure.